Dip your glass rim in some of the agave syrup then into the sugar and salt mixture. Chill glass in the freezer. Fill a cocktail shaker with ice then pour in the tequila, the watermelon puree, the Cointreau, lime juice, agave syrup, pinch of salt and the drops of hot sauce. 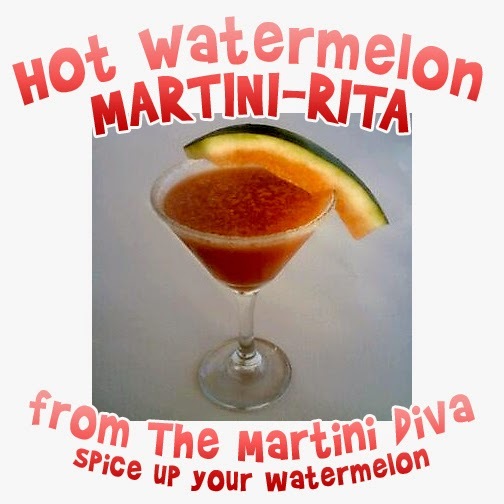 Shake until well chilled, pour into your chilled glass, garnish with a slice of fresh watermelon. If you'd like, you can add a pinch of salt and couple of extra drops of hot sauce to the watermelon! I've said this before on my food blog, I'm a lazy cook. I spend most of my gastronomic energy on my cocktail creations and I don't have the time nor the inclination to spend the rest of my day slaving over my meals. BUT, I love good food. So, I cheat. As much as possible. 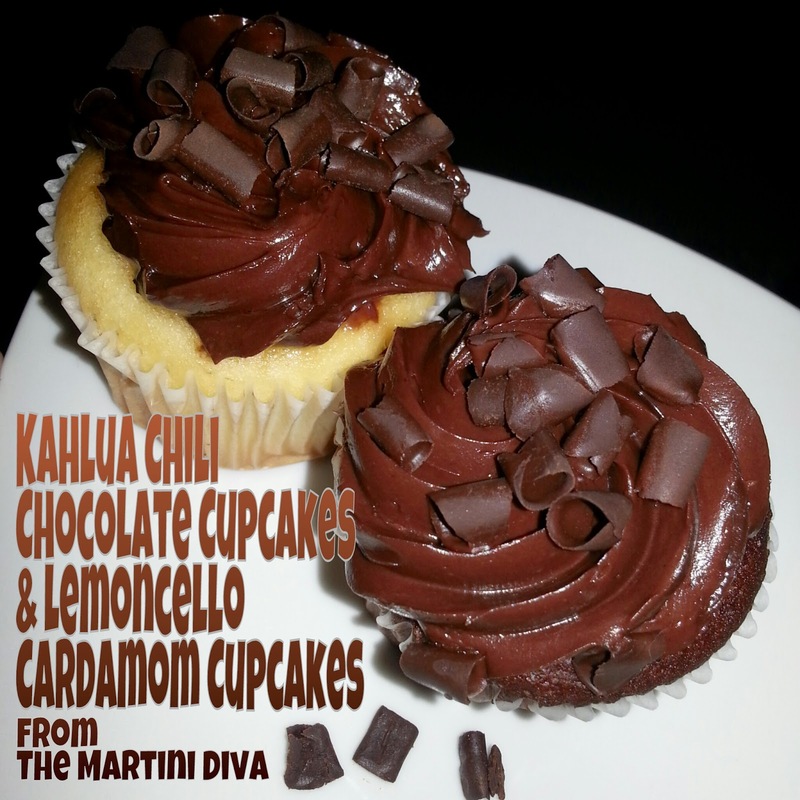 Thus, when I decided to make myself some booze infused cupcakes I used (SHOCK! SHAKING OF FOODIE HEADS! TSK TSK!) boxed chocolate and white cake mixes and canned chocolate butter cream frosting. Then I cranked up the old oven, grabbed a couple o' bottles of cupcake friendly hooch and set to making some moonshined magic in cupcake liners. Follow box instructions except: Use cold coffee instead of water and add 2 teaspoons of fresh chili powder to the cake mix. Bake. Cool. Poke holes in the cooled cupcakes then pour a tablespoon or so of Kahlua slowly over the holes allowing it to soak in. Add 1 teaspoon each of cocoa powder, powdered sugar and chipotle hot sauce to the canned chocolate frosting. I pre-mixed the cocoa, sugar and hot sauce into a paste. Follow box instructions except: Add 3/4 of a teaspoon of ground cardamom to the cake mix. Bake. Cool. Poke holes in the cooled cupcakes then pour a tablespoon or so of homemade LEMONCELLO slowly over the holes allowing it to soak in. Add the zest of one lemon to the chocolate frosting. Bring a bar of high quality, 70%+ Dark Chocolate to room temperature. Use a y-shaped potato peeler and draw down the narrow side of the bar over a wax or parchment paper lined cookie sheet. Chill curls in the fridge. Lick the chocolate off your fingers. Eat the rest of the chocolate bar. Mix, bake, cool cupcakes. Drizzle booze. Pipe frosting. Sprinkle curls. Do I need to tell you to use cupcake liners? No. I figured not. 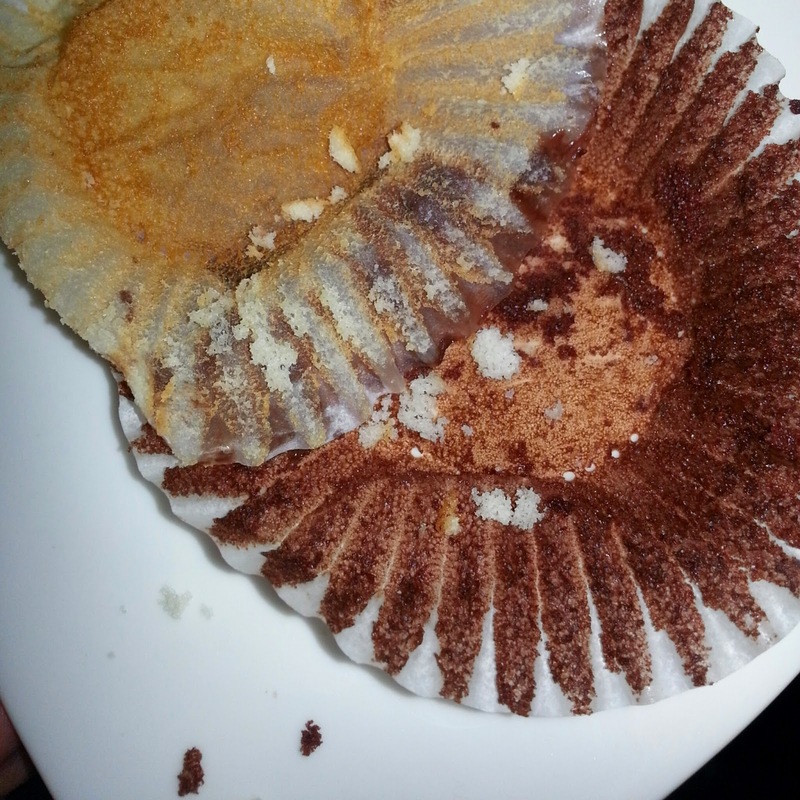 The nice thing about drizzling a bit of booze into your cupcakes? They stay moist way longer. And, of course, you get a little buzz! Easy peasy, boozy woozy, happy slappy. Dij I eat too many? No, I nidn't, I juss fleels shappy.